These Tibetan pilgrims have utterly nothing in common with Chaucer’s. They will tell no bawdy stories and engage in absolutely no untoward behavior. Their devotion is real, as is the danger they face while making the 1,200 mile journey to Lhasa, straight down Tibet’s National Highway 318 in Zhang Yang’s docu-hybrid Paths of the Soul (trailer here), which screens as part of the 2016 Doc Fortnight at MoMA. Nyima’s uncle Yang has always been a father figure to him, so he readily agrees to accompany the patriarch when he resolves to finally make his pilgrimage. Eventually, eleven members of the extended family are chosen for the trek. Each will have their particular reasons for joining, but all share a deep but unfussy belief in the tenets of Tibetan Buddhism. The pilgrimage is especially meaningful for Uncle Yang, who always regrets his younger brother died before he could make the journey he always talked about. In accordance with their selfless faith, Nyima’s teenaged sons will be praying for the two laborers who died while constructing their house. The presence of the pregnant Tsring initially seems completely baffling, but the karmic benefits for her baby are apparently well worth the effort if she delivers during the pilgrimage. Likewise, the ritual journey hardly looks appropriate for the ten or eleven-ish Gyatso, but what she learns will last a lifetime. Spanish Catholics might think the pilgrimage to Santiago de Compostela is a tough road to travel, but they have nothing on Tibetan Buddhists. Yang and his family are not merely walking over two thousand kilometers, with their tractor trailing behind. They must stop after every three or four steps to kowtow. That entails complete prostration on the busy mountain highway. To facilitate these regular acts of obeisance, they wear the pilgrims’ clothes: full body aprons and hand-planks. This is an absolutely grueling film, but also a powerfully moving one. Yang and clan will endure inclement weather, rock slides, and one auto accident. Yet, there is also hope and hospitality to be found along the way. Throughout it all, their faith and their family cohesion are too strong to even be tested. Watching them plug ahead is truly awe-inspiring. To what extent the non-professional actors are playing themselves or namesake characters hardly matters (either way, they are incredible), because the conditions they endure are more than real enough. By the time they reach Lhasa, you hope to see the Dalai Lama himself triumphantly swoop down on a giant golden eagle to personally bless each one of them. 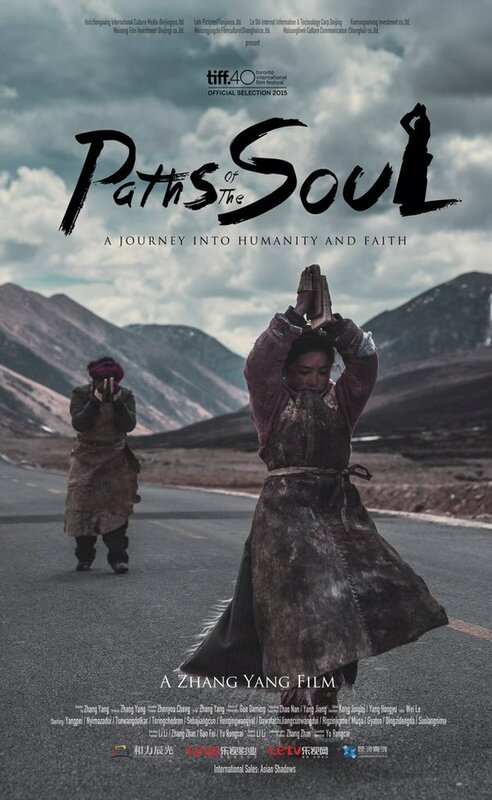 In all honesty, Paths of the Soul is one of the least showiest, but most profound films about religious faith in action you might ever see. The fact it was produced and approved for distribution in China is a not so minor miracle. Perhaps the state censors were hoping the arduousness of their journey would dissuade others from making similar Lhasa pilgrimages. However, the dignity and purity of the pilgrims’ faith is unmistakable and tremendously stirring. Very highly recommended, Paths of the Soul screens again today (2/27), as part of this year’s Doc Fortnight at MoMA.